Those eagle-eyed readers among you will already have spotted the change to this week’s UFC main event preview. This week we’re going to turn our attention to Friday night’s co-main event, which offers a women’s strawweight clash with genuine significance in the UFC’s 115lb division. Both Claudia Gadelha and Jessica Andrade have already had a shot at UFC championship gold, but both women fell short against the division’s all-conquering champion Joanna Jedrzejczyk. Their respective bouts against "Joanna Champion" may offer some insight into who will emerge victorious from their head-to-head this weekend, too. There’s no doubt that both have distinct advantages over the other. Andrade is a pocket battleship. A ball of energy with ferocious punch power, Andrade is at her most dangerous early on in fights, where that power is at its highest. But her striking, while powerful and relentless, is relatively rudimentary. There’s little in the way of crafty trap-setting or feinting. She just walks down opponents and throws leather. Against anyone but the very best, that’s usually enough to earn victory. But against Jedrzejzcyk it wasn’t good enough. The Polish world champion’s superior footwork, solid chin and excellent counter striking meant Andrade was punished every time she came winging in with big shots. Gadelha has OK striking, but isn’t an elite exponent of the striking arts like Jedrzejczyk. But Gadelha’s aces aren’t so much in her stand-up, but rather on the mat, where her Brazilian jiu jitsu black belt comes into play against Andrade who, as a BJJ purple belt, is less seasoned in the grappling art. Seven of Gadelha’s 15 career wins have come via submission, and her grappling skills were on display for all to see in her most recent outing, where she tapped out another former title challenger – Poland’s Karolina Kowalkiewicz – in the first round at UFC 212. Remarkably, it’s Gadelha’s only submission finish in the UFC. Does Joanna hold the answer? Reigning champion Jedrzejczyk is considered one of the best, most dominant champions in the UFC today, so is a fair yardstick to measure against, especially with both fighters having taken on the champion over the past 18 months. 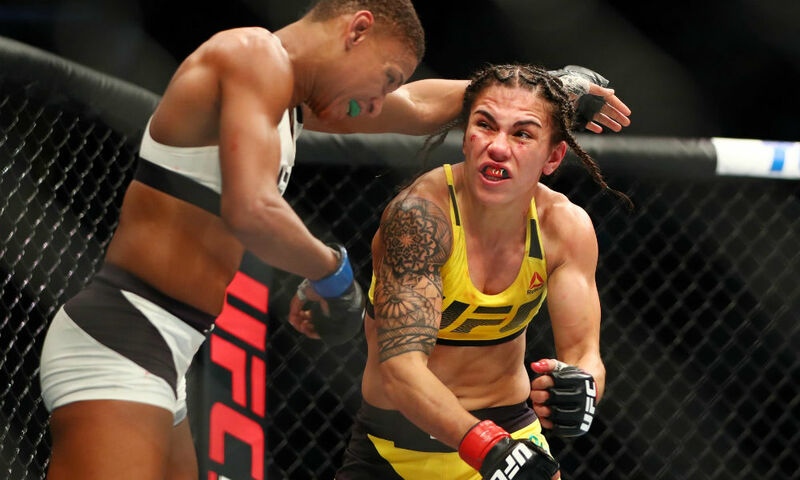 Andrade looked to impose her high-pressure, high-power striking game on Jedrzejczyk, but was easily outmaneuvered by the champion, who ran out a landslide winner on the scorecards. In fact, she won every round on every card, with one judge giving the champion a 10-8 round – such was her dominance throughout the contest. Gadelha, by contrast, pushed Jedrzejczyk to the limit in two contests – one standard three-rounder before either were title contenders and one with Jedrzejczyk as champion. The title fight saw Gadelha have good success early, wobbling the Pole and looking to have the upper hand, but as the fight wore on, the Polish world champion started to take over and eventually won down the stretch. The three scorecards gave Jedrzejczyk margins of two rounds (twice) and three rounds, but nonetheless Gadelha was certainly competitive. 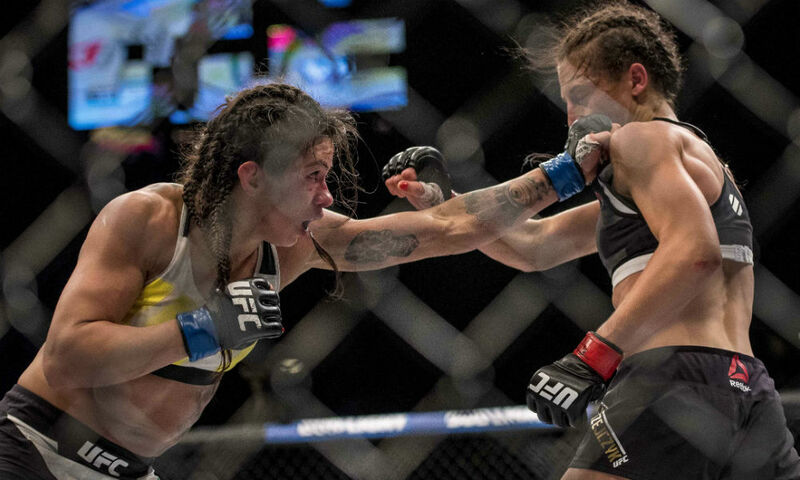 Comparing the two Brazilians’ performances, it’s clear who is the more skilled, more well-rounded fighter – Gadelha. 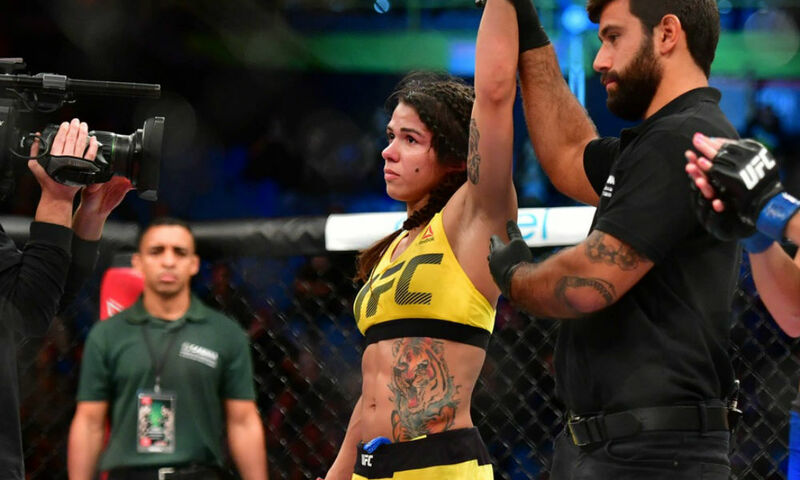 Overall, Andrade has the power advantage, especially early in the fight, but over the full five rounds, Gadelha has more tools at her disposal to win the fight. If Andrade is to win this fight, it’ll have to happen early by catching Gadelha cold, but Claudia is probably the best strawweight in the world not named Joanna Jedrzejczyk, and I believe she’ll negotiate those tricky early rounds to defeat Andrade late on – either via decision or by submission in the championship rounds.